Identify this ship, where, and when. HMS Royal Ark, Cammel Laird Yard, Birkenhead, 13 April 1937. Very good as usual, Ulrich, but what time of day? Gerard: You are really asking for a lot. It looks to me like it either early in the morning or late afternoon. The ship must be facing south to be launched into the Mersey. Right? So it is late afternoon????? It would be nice to know when high tide was on 13 April 1937. The Mersey has very high tides in the spring: 10 m. I give up! The openings in the bow! Ark Royal had them but they stood closer together – they looked more or less like one with a traverse in between. And I think Ark Royal was launched with her catapults in place and I think they did overhang the flight deck a wee bit!? No sign of a catapult here! It is not a Colossus for it has three bow anchors. But it is British and it is big. For these two features I would throw a member of the Illustrious class into the ring. I admit that is far less precise than Ulrichs suggestion but may be closer ? NO, that photo is not of the Ark Royal. Photo of Ark Royal's launching attached here; see differences. Photo. 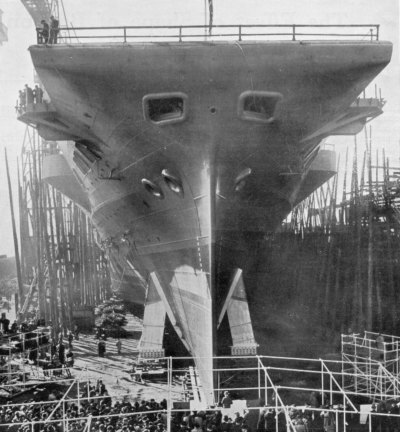 The launching of the Ark Royal on 13 April 1937. Final answer coming soon but keep trying. That would leave us with the which one, where and when to sort out ... only! HMS Illustrious at Vickers Barrow in Furness at April 5th 1939. I am sure it is not HMS Indomitable but for the other Sisters ... well, bit of an educated guess. What about the HMS Victorious? OK guys, it seems that by now you all agree it is an Illustrious Class aircraft carrier and that is correct. All we need to know now is which one? Illustrious, Victorious, Formidable, Indomitable, Implacable, Indefatigable? 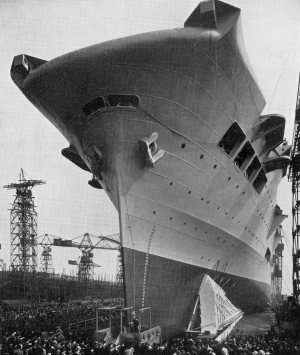 and the mystery ship is… the HMS Illustrious, aircraft carrier of the 1936 Programme, launched at the Naval Construction Works of Vickers-Armstrongs Limited, Barrow-in-Furness, on April 5, 1939. The launching ceremony was carried out by Lady Henderson, the wife of Admiral Sir Reginald Henderson, G.C.B., who had been, Third Sea Lord and Controller of the Navy. Ufo was right from the very beginning.